Research report from the exploratory study of music education based on a participatory model is out now. Full report is available HERE. Polish version is available HERE. 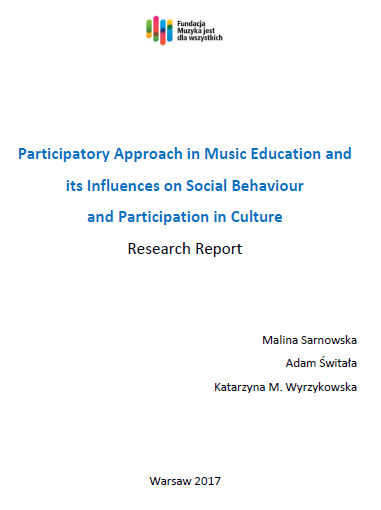 The research presented in this report is a case study of a music education programme based on a participatory approach introduced in a community centre in the Praga-Południe district in Warsaw. Due to its short duration and narrow range of research activities, the study is exploratory in its nature. The research is an attempt to depict and analyse the characteristics of informal music education based on a participatory approach and to put a light on certain research areas, as well as to define specific research topics, for further investigation. Our long-standing pedagogical experience in music education and educational projects aiming at social inclusion inspired us to make an attempt to describe the fundamental features of a participatory approach in education. We did not intend to create nor to introduce any new and innovative teaching methods, nor to focus on particular aspects of some of the methods already being used by music educators, in a comparative, competitive way. Rather, we wanted to make the first steps in defining a methodological framework broad enough to fit many methods and their individual variations. It is our intention to make the frame flexible, yet firm enough to support music teachers and facilitators aiming to create a safe and stimulating learning environment with the use of various forms of music making and improvisation. Sadly, the participatory approach in music education has not gained much attention in Poland so far. There are hardly any published papers based on local research and the majority of renown subject literature has not been yet translated into Polish, (Elliott 1995, 2015; Mills 2005; Chambers 2007). Therefore, the necessity of defining a flexible framework for creative teachers and facilitators working with children and teenagers in formal and informal education appears urgent. One of the main challenges we had to face while joining the programme was to accommodate the proposed music education formula in order to make it fit in the tight schedule of an educational facility in which music is not (neither should be) a primary activity. We had to re-think and revise our initial ideas about the general function of music education in order to make all of the stakeholders (ie children, other educators, parents) and the whole of educational processes benefit from it. Some of the other key challenges were: no permanent group of participants (many of the children failed to attend regularly), significant age differences between participants and their diverse social and economic background. Moreover, a vast majority of the children did not own a musical instrument.